As the weather cools, rodents seek refuge indoors where there is easy access to food and water. Rodents are vectors for spreading disease, which can put your flock at risk, so it is important to have a control plan in place before you notice an issue. 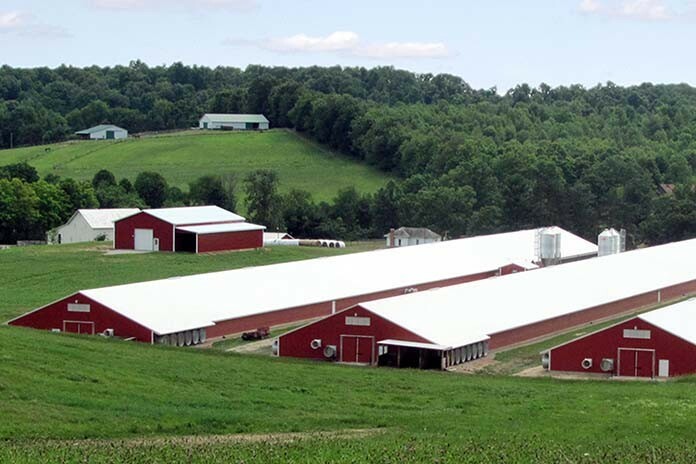 Bryan Maier, an Abell Pest Control expert based in Kitchener, ON, Canada, shares his insights on how to prepare your farm so rodents stay out of the poultry house. A rodent control program for a poultry barn is an integral part of the biosecurity and livestock safety of the facility. It can be somewhat overwhelming when thinking about how to keep rodents out of a barn; however, when broken down, a rodent control program can be manageable with a little work. Every effective rodent control program begins around the exterior. Implementing a first line of defence can pay dividends on controlling rodents inside. Reduction of outside harbourage around the barn is critical. Rodents need cover to survive, and they will avoid being caught out in the open and exposed at all costs. A gravel barrier of 3-4’ along all exterior walls is highly recommended. The gravel should be coarse, but not so much that it allows voids for rodents to hide in. Cutting back trees and grass from around the barn opens up the area and reduces rodent harbourage. Keeping the exterior free from equipment, barn items or feed spill will also help. Survey any exterior walls closely; any holes or gaps found under doors or windows need to be sealed. This may be difficult in older barns, however the better the barn is sealed the more difficult it is for a rodent to gain entry. Steel wool and expansion foam can be an easy, effective way to seal holes. Doors with good sweeps are also very effective. An exterior rodent control program is the next step. Tier 1 exterior rodent stations should be used. The laws in each province or state vary, however safety when using rodenticides must always be maximized. Placing of stations should vary with the condition of the barn and levels of rodent activity. 50-75’ (15.24 -22.86 m) and by entry ways is a base pacing range. Some areas are more conductive to high rodent pressure, which will then require more stations around the barn. Ideally stations should be off the ground 1-2” (2.54-5.08 cm) to keep moisture minimized. Most rodent baits contain wax which allows good longevity. Stations should be inspected no less than monthly. Frequency varies on rodent pressure and surroundings. Interior rodent control for most poultry barns can be difficult since rodent baits must be away from livestock and feed. Interior mechanical traps in entry ways, storage and maintenance rooms should be considered. Avoid rodenticide on the interior as the risk of rodent translocation is great. Interior rodent infestations may still occur despite all efforts to stop rodents on the exterior. They are, after all, the earth’s second most successful mammal next to humans. High interior rodent numbers can be serious and need to be dealt with swiftly. Sealing holes and minimizing food spillage is important but can be difficult. One of the first most important areas to look at for control is the barn attic. Heavy trapping or baiting throughout the attic area will reduce most of the rodents inside a barn. Roof and attic baiting and trapping is highly effective for barns and or houses. Increasing interior devices should also be completed if high rodent activity is found. These should be kept in place until captures diminish. Following these steps can greatly aid in keeping a barn free of rodents and aid in keeping healthy safe livestock.